I want to first say that I feel so rude for not thanking you all in my last post for your wonderful birthday wishes. I really appreciated each and every one of them and I was surprised by the number of comments I got from people who had never commented before. So thank you all so much! Wanna see what my sister got me? The Fall issue of Verena Magazine, which features an entire spread of men's sweater patterns that I love. I definitely recommend checking them out if you're a guy, or knit for guys. You can flip through some of the pages on that link to see a few of the patterns. There's one (okay, three) in particular that I really want to make. She also included a nice little (blue!) notebook that I'll be using for the podcast from now on to take notes and such. The notions case is from Fleegle's etsy shop, and it is absolutely fantastic. I'm tempted to go out to buy more things just to fill it up! What's that? Oh, you want to know more about that fiber? Sure! It is two ounces of beautiful merino from, oddly enough, a bead store (or at least that's what I think it is) in San Diego. You guys, really, this stuff is absolutely gorgeous. It took quite a bit of pre-drafting to get that to be spin-able... However, this new merino feels a lot less sproingy and crimpy, I wonder how it's going to behave as yarn. It's not at all compacted right now and I think it's going to spin like a dream. ::sigh:: This is one of those times I really wish I had a wheel. My mom also sent me some cute stationary from the Knit it Up etsy shop. The one at the top of the picture, on the back, says, "...but I'm really thinking about yarn." Oh! I also did some swatching the other day with some really pretty colors of Malabrigo (tortuga, bobby blue, and apple green) to potentially make a hat. I love malabrigo hats. It no longer exists. I am no longer tempted to combine those three colors into a hat. Actually, I think those Malabrigo colors work quite well together, and just remember you were born in the 80's. Retro is fab! I'll definitely need to track down that magazine, though I'm thinking Black Friday may not be the day to do it. Nice haul! The fibre does look carded, but you should be able to tell better once you open it up. The links you included are dangerous - now I'm going to cruise Etsy for an hour, at least. Enjoy your gifts! P.S. 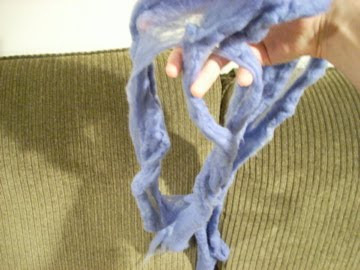 Yes, the fiber is from a bead/yarn shop here in San Diego called Shepherdess. Cute place! I also think the malabrigo colours work very well together. If my monitor is showing them truly, and the darkest colour is a deep brown then it really is a very now combination. I keep seeing more and more deep browns mixed with brights. Your presents all look lovely, and I hope you are enjoying your time away from school. I'm guessing that "denim" is top. (Combed fiber) Multi-coloured top where the colours run continuously and consistently along the length is very common. Ashland Bay is a major distributor, and most spinning supply shops will carry it. You'll have no problems spindle-spinning it. Get it open, shake it to get some air in it, and see what happens. Email me if you want help. Can you please have your people call my people about cool gifts for knitters? The fiber is fantastic. And having lived as an adult through the 80s, I can tell you that those are not 80s colors. Mauve, or peach, and that sort of vomitty-minty green are 80s colors. Etsy is a blessing and a curse. You can find such fabulous unique things. The fiber is gorgeous, and that notions case is awesome! I kind of dig the Malabrigo combination. If you really can't handle it, maybe adding one additional color into the mix would help(?). Very funny about that swatch! It is not something I would be tempted to pursue either. Happy un-birthday my favorite yarn boy blogger! It's probably top. Most commercial preparations like that are top. I'm also gonna weigh in and say that those colors of Malabrigo look great and current together. Interestengly, they don't read as "retro" to me at all. Also, you can change the "feel" of it by changing the stripe width/interval, etc. Play with those ideas til you find something you can live with; a Malabrigo hat is too yummy to possibly miss! Love the cards, especially the one that says "sock yarn doesn't count!" Is there something fundamentally wrong about the '80s? I have some fond memories of my childhood. ;) I love the color combo! !